At the general meeting of ACU3A on 16 May, Matthew Armitage of Tooley’s Boatyard in Banbury presented a series of photographs tracing the history of the boatyard from 1790 when it was established to build and repair the wooden horse-drawn narrow boats that plied the newly constructed canal network from the Midlands to London, so vital to the development of the Industrial Revolution. Gradually, rail and then road transport eroded the importance of the canals (although during the Second World War they were once again used extensively), but Tooley’s continued to operate as a family business until 1995, when its future was threatened by the Castle Quay development in the town. However, good fortune prevailed, and the site was saved and incorporated into the new Museum and Heritage Centre. The purpose built 39 ft. day boat “Dancing Duck” was built at Tooley’s in 2007 and launched into the canal side-ways on the 7th July the same year - the first time a boat had been launched that way for 90 years. But, despite initial misgivings, the boat remained upright and has since been hired out for self-drive or private skippered trips. The current rate for a private skippered boat trip for up to 12 passengers (9am – 5 pm Mon-Sat) is £30 per half-hour or £65 per hour. 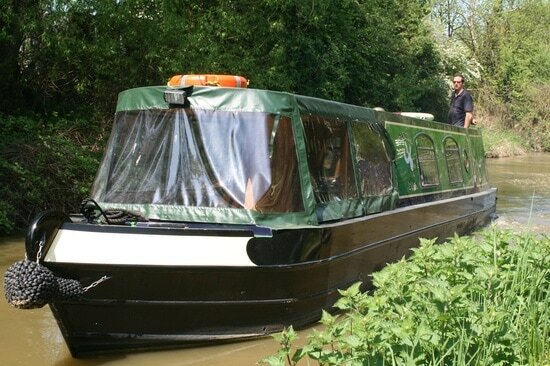 It sounds like something that might appeal to a number of ACU3A members for a couple of hours one sunny summer afternoon with a picnic on board – or, alternatively, an hour-long boat trip incorporated into a longer walk along the canal. Group leaders take note! Thanks to Colin for arranging yet another interesting talk.